A Sega fans favorite. This third-party Sega Saturn controller was designed to allow you to have an exact replacement controller for your Sega Saturn. Is your Saturn controller missing or no longer working? Here comes your perfect replacement controller for the SEGA Saturn. Not only does it have the same classic feel but also includes a six feet cable. Be ready for battle now. 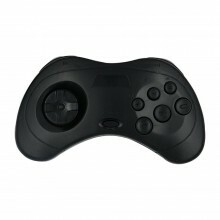 It has a circular D-Pad, a start button, and six face buttons; A, B, C, X, Y and Z. It also has the specific Sega Saturn two shoulder buttons, L and R which brings the total number of buttons to nine. Like the Mega Drive Control Pad(s) before the Saturn, it is ergonomically designed for maximum comfort. Click the button below to add the Sega Saturn Controller Black to your wish list.